Ayurveda is a science of the preservation of life that heals body, mind and soul. Cancer is abnormal growth of cells, tissues in body. Nowadays cancer is considered as a burning problem that are developing in people worldwide. According to Ayurveda the abnormal growths depends upon type, size and location and named as granthi, arbuda, gulma, asthila, balmika and shaluka. “Granthi” as per Ayurveda is a term for a tumor, nodule or lump that is visible from the surface. It may be benign or malignant. “Arbuda” is termed as a cancerous malignancy. “Gulma” is defined as any palpable, hard mass present in the abdomen. “Asthila” is abnormal growth present in prostate gland. “Balmika” is growth of cells due to weak immune system and “Shaluka” is related to abnormal growth in upper extremities. As per modern science cancer is referred as “neoplasms” found within particular body tissues or organs. These neoplasms are divided into two pathogenic natures, benign and malignant. According to Ayurveda the main reason for a disease is imbalance of three -energies (tridosha) vata, pitta and kapha in body. The Ayurvedic words “Tridoshja” abnormal growth or “Sannipataja” is used to indicate the malignant stage of the neoplasm. The word “Vataja” or “Pittaja” or “Kaphaja” or combination of any two of these doshas (Vata-Pitta or Vata-Kapha or Pitta-Kapha) is used to signify a benign neoplasm. In tumors and cancer the causative factors affect all the three doshas mainly increase and vitiate the kapha dosha in body. High accumulation of doshas convert normal cells into cancer cells, characterized by unrestricted, uncontrolled and purposeless growth leading to tumor formation. In all type of tumors, masa dhatu (muscular tissue) and meda dhatu (adipose tissue) and kapha dosha are always affected. The causative factors vitiates three dosha with rakta (circulatory system) and masa dhatu (muscular tissue). These vitiated doshas and dhatus get localized in skin, muscular tissue or other organs and lead to localized swelling. This causes tumor that is usually immobile and does not suppurate. Kapha dosha is dominantly present in all tumors. Gulma (Tumor like mass formation): Vataja Gulma: The tumors are present in the large intestine or pelvic region. Symptoms may be pain in the neck, headache and fever. The skin, eyes, nails and feces become dark. Skin and mouth are usually dry. Pittaja Gulma: These tumors are present in small intestines. Digestive discomfort is felt by patients. Skin, eyes, nail and feces become yellow. Kaphaja Gulma: These tumors show growth in chest or stomach. Patients feel loss of appetite, nausea, low grade fever, pain and skin, eyes, nails and urine becomes whitish. Raktaja Gulma: These tumor are termed as ovarian cysts and uterine fibroids. The condition is sometimes described as false pregnancy where a mass forms instead of an embryo. Women are suffered with excessive menstrual bleeding leading to fatigue and anemia. Vataja granthi: These tumors are dark and black in color. It is able to move from place to place. Pittaja granthi: There is burning over the tumor. Tumors appear yellow or red in color. Kaphaja granthi: It is presented as painless hard tumors that are pale in color. Raktaja granthi (Blood circulation): It is caused by infestation of parasitic worms. Mamsaja granthi (Muscular system): It is consider as myoma or benign tumor of the muscle. Medaja granthi (Related to fats): It is similar to a lipoma or fatty tumor in body. This type of tumor often occur in neck, back, shoulders and wrists. Asthi granthi (Related to bones): present to bone spurs or an osteoma. These tumors appear as hard growth within bones. Sira granthi (related to vascular system): These are vascular tumors known as angiomas. The tumors are painless and do not pulsate. Vrana granthi (related to ulcer): Tumors that form dried blood surrounding, a wound or ulcer. Nadi dhatuja granthi (related to nervous system): It refers to benign tumors like neuromas and neurofibromas. Lasika granthi or vahani (related to lymphatic system): This tumor is called as lymphadenomas and lymphangiomas. It is considered as tumor of the lymph glands. Tilaja granthi (Related to skin): This is refer as skin cancer in body. These are malignant cancers. 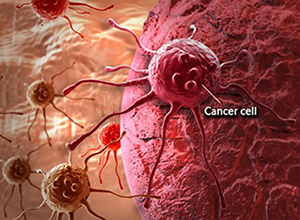 These are most dangerous cancer cells present in the body that are life-threatening. The vataja, pittaja, kaphaja, raktaja, mamsaja and medja, sites for cancer development are same as described in benign tumors. In malignant cancer the cells can also travel to other parts of the body through blood and lymph systems. Sarcoma is a malignancy that begin in bone, cartilage, blood vessels and muscles. Leukemia is a malignancy in blood forming tissue like bone marrow. 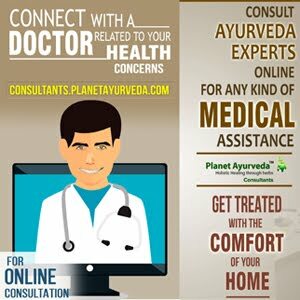 Ayurveda is the best way to treat any type of chronic or acute disease. The herbs used for cancer patients stop the growth of unwanted cells, tissues in body. These herbs work on imbalanced dosha and dhatu. Hence lifespan of an individual is increased by using this treatment. Although, Ayurvedic treatment takes time, but it can manage the disease from its root cause to heal body, mind and soul. Some people think that they should not use ayurvedic treatment along with radiotherapy and chemotherapy. This misconception can make life-threatening condition to cancer patients. Use of ayurvedic therapy with chemotherapy and radiotherapy acts as a Rasayan therapy for patient life. Ayurvedic therapy increases the life-span of an individual. The medicines mentioned below can provide very impressive effect to protect body of cancer patient from side-effects of radiotherapy and chemotherapy. Planet Ayurveda offers group of herbs that balance dosha and dhatu in body. The herbs are used from ancient practices in formulation that give very effective results in cancer patients. These herb stop the growth of cancer cells in particular area. Herbal Medicines used for cancer are easy and safe for use. For best result use this treatment as per the dosage prescribed. As the name suggests punarnava - punar means "again" and nava means "new". These capsules help cancer patients to start their new life again by destroying cancer cells in body. The standardized extract of punarnava is used for capsule preparation. The use of capsules reduce the growth of cancer cells, tumor, inflammation and swelling on the affected area. It helps in detoxification of the body. Recommended Dosage: One to two capsules, twice daily with plain water after meals. Herbal extract of Giloy (Tinospora cordifolia) is used for preparation of guduchi capsule. The herb possesses anti-inflammatory, anti-cancer, anti-oxidant, antipyretic and immunomodulator properties. These properties work on cancer cells and stop their growth. Herb used in these capsule builds up a great immune-system in body. Capsules deals with the signs and symptoms related to cancer patients like fever, weakness, loss of appetite, swelling, inflammation and pain. Pure extract of Graviola herb (Annona muricta) is used for the preparation of capsule. Its antioxidant property gives effective results in various cancer. In breast cancer: Inhibits breast cancer cells growth. In colon cancer: Acts as an anti-tumor agent that stops cell growth. It gives very well results along with chemotherapy. In liver cancer: The presence of compounds like longifolicin, corossolin and corossolone etc in it stop caner growth in hepatic system. In pancreatic cancer: It helps to induce necrosis of pancreatic cancer cells by inhibiting cellular metabolism. Swarna bhasma tablets are formed from pure gold particles. Swarna Bhasma acts as a Rasayan therapy that improves quality of life. These tablets stop the growth of cancer cells and improve immunity to fight off the unwanted growth of tissues in body. Its anti-oxidant, anti-microbial, anti-viral and anti-cancer property treats various cancer. These tablets reduce the symptoms like fever, loss of muscle, weakness, loss of appetite, inflammation. Swarna bhasma tablet increases immunity of a person that helps to fight against cancer cells. It removes toxins from the body to keep it healthy. Increases life-span of an individual. Recommended Dosage: One tablet, twice daily with plain water after meals. These capsules are prepared from ingredients like grape seed, wheat grass, spirulina, green tea and amla. Grape seed: A group of phytochemical antioxidant known as proanthocyanidins shows effective result in skin, prostate, colon, breast and lung cancers. It inhibits all stages of tumor growth. Wheat grass: It contains at least thirteen vitamins that show anti-oxidant property. Wheat grass acts as shotgun blast that kills cancer cells and stops its growth. Spirulina: It is a blue-green algae that specifically target cancer cell healing. Spirulina targets breast cancer stem cells growth, detoxifies the body, heals the gut and boosts immune system in body. Green tea: It helps to prevent formation and growth of new blood vessels in tumors. This herb acts as antioxidant that detoxifies body. Amla: Amla is rich source of vitamin C. It shows great medicinal value because of antioxidant, anti-inflammatory, analgesic, anti-cancer and immune-booster properties. These capsules are prepared by moringa (Moringa oleifera) herbal extract. The herb has antioxidant, anti-inflammatory, anti-cancer, analgesic, detoxifier and immunomodulatory properties. Its properties show effective results in cancer patients. Routine use of these capsules stop growth of benign and malignant cancer. So, to get rid of any type of cancer with its worst signs, symptoms and side-effects on body, you can use these medicines and surely one can get positive results. These medicines increase power, stamina and life-span of cancer patients up to a very good extent.